Have you ever struggled to write your next blog, newsletter or create broadcast your next live video? You know you have to do something and your audience needs to hear from you, especially if you are trying to gain the attention of those seeking information on the Internet or to keep your followers engaged. One of the biggest opportunities new online entrepreneurs have is the way they PLAN their content creation, if they plan at all. This is a serious problem to overcome. Considering that the rule still is, CONTENT IS KING. Your online business depends on it. Without it, you will be forgotten or irrelevant. People will forget your name and brand and your page views will drop, probably faster than they ever climbed. I’ve seen this situation many times. You’re all keen to create some content, you have the time and the energy and focus. You sit down in front of your computer and try to think of what you want to write or say, and then you realize… It’s like you are staring at a wall. You haven’t put any thought into it until right then. You don’t have a complete idea. You are not sure the timing or your subject makes sense. You might not have images to go with the content. You don’t have a call to action to make it all come together and work for you. That wall has now taken the time, the time energy and focus away from producing something and put you in a paralyzing state of contemplation. And you might stay there for a while before being able to create some good content. If you are a perfectionist, you’ll be there a bit longer. When you put your words out there, you want it to appeal to people. You want them to want more. This is how you grow your business. You don’t want to look foolish and you certainly don’t want your work to be dismissed or overlooked. The most common mistake is thinking you’re going to write or broadcast great content once a week and post it or send it out every Monday. That is not a plan. That’s a schedule. It has nothing to do with the content except for when it gets delivered. We are not creative on demand; we can’t expect ourselves to be. It’s even more difficult to pull together a complete idea and marketing strategy that works in line with your overall marketing plan and branding. So lets not hold ourselves to this method. If you are an entrepreneur, then you are an entrepreneur 24 hours a day, every day. And your ideas and concepts will come to you while you’re doing various things in business and in life. WRITE THEM DOWN. Start creating a list of content ideas as they come to you. And please don’t try to remember them. You have a smartphone or a tablet; just type it in. If you don’t, there is a good chance you will forget it or at least the context of your idea. TAKE PICTURES if you’re somewhere that sparked an idea. Visuals that closely work with the written content are powerful. Why waste extra time trying to find and possibly pay for an image to suit your content? This is the most cost effective and authentic way of adding images to your work. It will make a big impact. HAVE A GROUP OF SUBJECTS/TOPICS, and they should mirror your categories of your blog page. This way you stay within the focus of your business and brand and don’t go off on a tangent into some new subject that is a grey area. You might lead your audience away from your product by not staying within your area of expertise and brand. When you commit those subjects/topics commit them to memory so you can clearly identify a good idea when it comes to mind. CREATE A CONTENT FLOW CALENDAR. Like I said before, it’s not just scheduling one blog or newsletter a week. Look at the whole year. Plug in where your launches are and the context of those launches. Then you can plan what type of content gets posted and when. This is very helpful to your overall marketing and sales plan. Knowing when to post on certain topics is almost as important as the topics themselves. This can also make things much easier when you go to add a call to action to your content. Because it will be in alignment of your launches and your audience will be more in tune with the exciting things happening in your business. When you follow these 4 SIMPLE STEPS you basically have removed the obstacles that you would face when you don’t plan. Look at your CONTENT FLOW CALENDAR and see what SUBJECT relates best with your LAUNCHES. Look at your LIST OF IDEAS and choose one that is the right SUBJECT. Find the IMAGES you have acquired for the content so they are ready to add. Create a compelling CALL TO ACTION that works well with the SUBJECT and your LAUNCHES. This will make the best of your time energy and focus when you create content. Even if you are a perfectionist, you’ll have to admit this could really help you get the ideal piece of content produced. And most of all, it should have a better impact on your business. 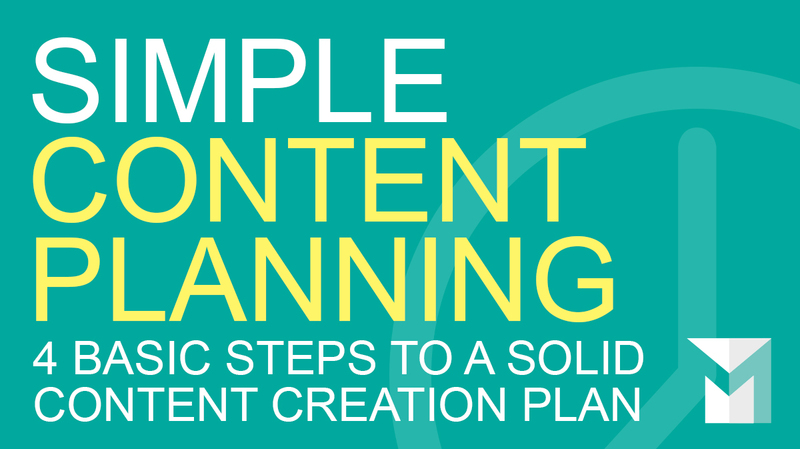 If you would like to know more about SIMPLE CONTENT PLANNING or creating a CONTENT FLOW CALENDAR please contact me at jasonwiehler@managemeant.ca so I can answer your questions.